I am going to be going to Mexico for 7 days in February and I noticed that Telcel America is a Tracfone company. My Alcatel TCL LX has DL in the specs and I read quite a few threads that if you sim swap between TF carriers it's OK. I was considering getting a 7 day pass for TelCel America, plus a nano sim which costs $21 and it appears to be the cheapest solution without getting a totally different phone. So can I just pop out my existing sim for TF , and put the Telcel one in my current phone and then swap back when the 7 days are up? I wont be transferring my number to TelCel, only activating the SIM for 7 days. Is there anyway that you can obtain the Telcel America SIM and try it in your phone before the trip to see if the phone will accept it? My Simple Mobile Moto E5 (XT1920DL) will accept a TF SIM for Verizon, AT&T, T-mobile. But I don't know about a Telcel SIM. I think there are some areas in the Bay Area which may specialize in TelCel America distributors the same as Simple Mobile so I may think about that. Not trying to split this into a seperate topic, but I read Simple Mobile will roam on TelCel in Mexico, but they say excessive roaming can get your phone shutoff in a hurry if your primary usage is international. They have free phones with plan purchase but the only model, LG Rebel 2 and LG X Style seem to be out of stock. The TelCel America website seem to only sell plans and sim cards. I recall visiting Walmart one day and seeing a TelCel America ZTE Whirl 2 phone boxed up, it said a company of Tracfone Wireless. I don't really want to spend more than I have to for 7 days of usage. I guess Tracfone won't work over in Puerto Vallarta so best I can use the phone for is connecting to WiFi in my hotel plus using it for photos. Pfft! Is the TCL LX activated? If so, did you have to give the IMEI? Will Telcel ask for the IMEI? Tracfone would probably use the IMEI identification to keep you from having service with two of their Companies on the same phone (IMEI). Who is the service provider in Mexico... GSM or CDMA? It is my unconfirmed belief that if you can get Telcel service activated on the SIM (maybe even a "TF" BYOP SIM) you will be able to SIM swap into the TCL LX and it will work. The problem is getting all this verified and accomplished in time to not waste any of the 7 days before leaving. The worst would be to find out last minute some part of your plan doesn`t work, and you do not have time to find and do a work-around. You just may be first, the ginny pig, on this project! Keep good notes so you can help others later. If you have a truly unlocked phone, it would not matter what SIM you put in, but phones from the Tracfone companies are not unlocked outside of those companies. TelCel America and TelCel in Mexico are different companies that have different purposes. My thought is that any of the "DL" phones will reject a TelCel Mexico SIM as foreign (pun intended). I guess the TelCel America site is having issues with checkout, I tried to add a 20 7 day pass and a 99 cent nano sim to my cart, no go. 500 error , so I guess I'm pretty much out of luck. Still have lots of research to do but I'm very determined to get a working solution in place by the end of the month. I guess the TelCel America site is having issues with checkout, I tried to add a 20 7 day pass and a 99 cent nano sim to my cart, no go. Maybe buy TelCel items on Ebay . Odd. I had no trouble getting both in the cart. Chrome on my phone. ebay may be cheaper though as they want $10 for shipping. You might want to try a different device and/or browser. But as noted above, eBay may be cheaper. 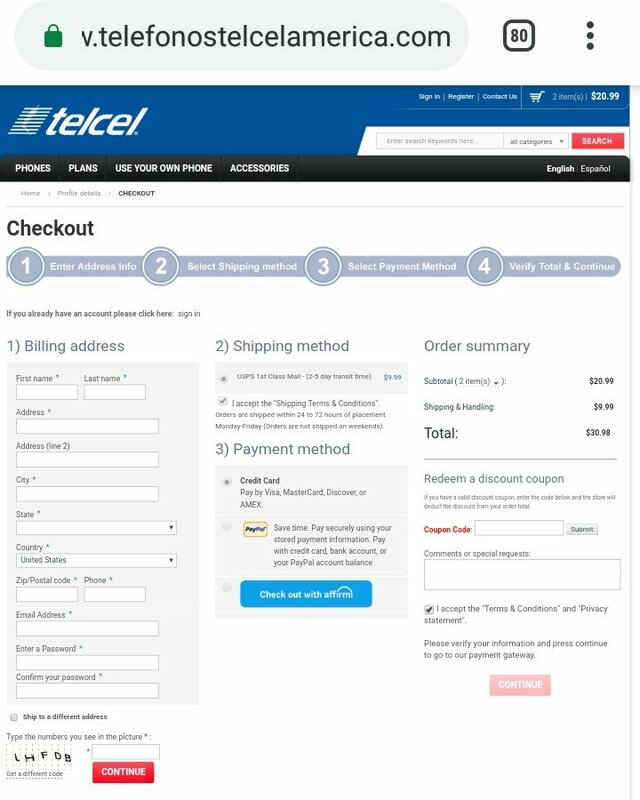 If you use code Telcel, you can waive the shipping charge. I put it in before the cart... Maybe I goofed up and put the information in too soon. Worked fine untill I tried to add that code. Maybe the promo code system is broken. Have to wait for the system to purge my cart (clear cookies) or use a different browser/device. I got a solution. I am probably going to put the phone in the drawer after its intended use. But Simple Mobile roams in Mexico, I got a free LG Rebel 2 with a $25 plan purchase. I'll activate it here with a new number and use it in Mexico for 7 days. Hi. Where did you get the Simple Mobile LG Rebel 2 free with a $25 plan? Thanks! Oh, was it from https://shop.simplemobile.com/shop/e...-lg-rebel-2-p5 ? If you're considering the Rebel 2, be aware that the specs on Simple Mobile site is incorrect/inconsistent. Near the top of the page, it says the Rebel 2 has 5.7" HD screen, 8GB internal memory. Down below under "More Features", it says that phone has 16GB, which is incorrect. Specs on LG web site say the Rebel 2 has a 5.0" low-res (854 x 480) screen and 8GB internal memory, which match a TF-branded Rebel 2 that I had. If you have about 10 apps or more, besides the preloaded apps, that 8GB is a real PITA when trying to update apps on the Rebel 2. I got rid of it shortly after I got it (FREE) with a time card purchase. Thanks for the warning about the incorrect specs on the Simple Mobile site! Question about Telus' handling of new phones.